Toss garlic in salt. Place in saucepan and completely submerge in oil. Bring to a simmer and reduce heat. Stir gently every 5 minutes to ensure garlic cooks evenly. Remove from heat after 40 minutes or when garlic is very soft. Add chili flakes and herbs, and allow to rest in pot for at least 10 minutes. 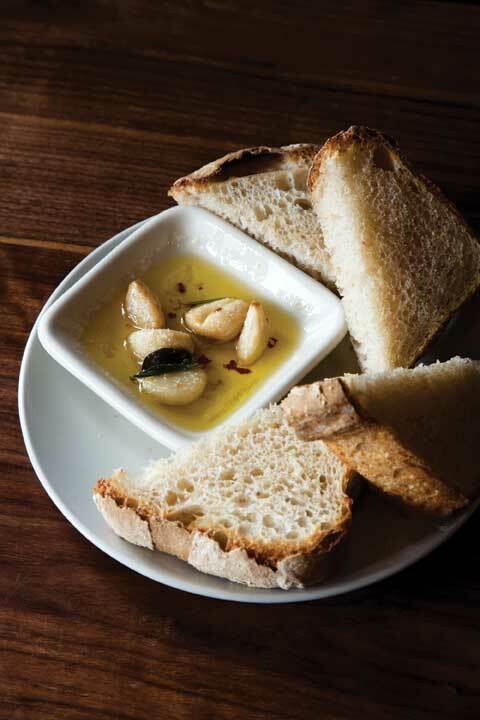 Serve garlic warm with toasted bread. Reserve oil to use in salad dressings, to enhance meat dishes, or to prepare the Outerlands grilled cheese sandwich.